45-Brésil Empire 1850-66 n° 18 600 r noir, oblitéré, charnière; une signature (brun ?). C76a no gum as issued. 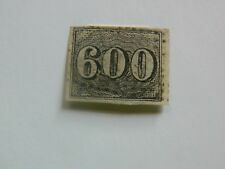 3x 466 no gum as issued (1 with few toning spots). Scott 79 is unused no gum. This lot is just the tip of the iceberg of a Brazil stamp hoard collected by Ed Zauel. Brésil, 260r Brun, neuf , TB. Qualité Oblitéré TB : Timbre Premier choix, sans aucun défaut. This lot is just the tip of the iceberg of a Brazil stamp hoard collected by Ed Zauel. Two very fine covers with good and attractive frankings. Brazil PROOFS 1881 1000r Dom Pedro and sunken die proofs. N°174 et PA28. Qualité Oblitéré TB : Timbre Premier choix, sans aucun défaut. O = oblitéré / used. ST = standard / average. Un certificat d'expert engage celui-ci sur l'authenticité de la pièce signée. = MNH = neuf sans charnière / mint never hinged. = MH = neuf avec charnière / mint hinged. Ausland / All over the World. Und hier noch einmal in englischer Sprache Innerhalb von Deutschland. And in most cases could be added right into your album. Very nice Brasil 1936 (29.01.1936) Condor Zeppelin Flight Cover Rio De Janeiro to Switzerland. BRAZIL : 1931 Zeppelin cover to USA. 1931 Zeppelin cover to USA. 4 Finance Drive, Suite 201, Danbury CT 06810. Verkaufe die auf dem Foto abgebildeten Briefmarken mit verschiedenen sehr schönen Briefmarken aus Brasilien Brasil. Complete set of pictures below. Many complete sets. Scott numbers are written on the pages. Not all pages are shown in photos. AMERIQUE - BRESIL - LOT de TIMBRES Neufs/Oblitérés + 6 BLOCS + DOCUMENTS PHILAT. (traces de collage/taches de rouille.). 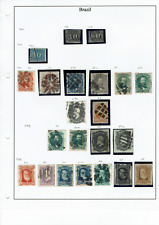 Lot de 24 timbres du Brésil . Brazil, Scott 61 - 67 in Used condition, as shown in the scan(s). Don't see what you like?. Next up on our world tour: More Belgium, Bolivia, Brazil, British Antarctic Territory, British Central Africa; and then on to British East Africa and British Guiana. BRAZIL (P2503B) SC 502-502A MOG. BRAZIL 1844 Thick yellowish paper 60r black fantastic massive 4 margins neatly cancelled black CDS and part manuscript. Seldom seen so fine.